The NCA and National Counter Terrorism Policing (NCTP) are appealing directly to the public for information that could prevent criminals and terrorists from gaining access to firearms and ammunition. 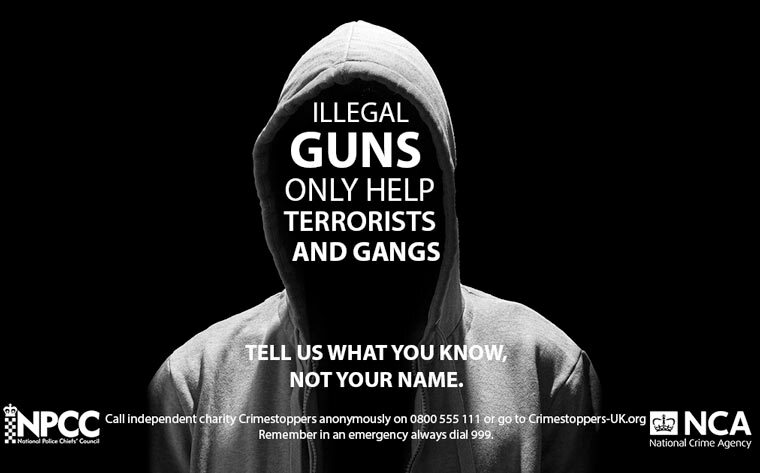 The appeal, led by two of the UK’s most senior officers, urges the public to call Crimestoppers with any information about illegally held weapons entering the country or being stolen from legitimate gun owners. With the current UK threat level from international terrorism remaining at severe, and with at least 10 terrorist attacks foiled in the last two years, officers want to ensure that weapons do not enter the hands of terrorists. “In the last year the NCA and Regional Organised Crime Units have arrested 128 suspects in firearms-related investigations and have seized 884 firearms,” says the National Crime Agency’s Director General, Lynne Owens. Assistant Commissioner Mark Rowley, the head of NCTP, said: “In the UK our detectives have a unique tactical advantage in countering terrorism. The relatively low level of weapons, especially automatics, compared to Europe and America provides more opportunity to intercept terrorists before they acquire them. Indeed about half of the plots we intercept involve terrorists seeking to obtain weapons. “But we cannot be complacent. Intensified counter-firearms operations by the NCA, the NCTP network and local forces, along with Border Force and other partners, are essential to maintain this advantage. “We need more help from the public and are appealing for people to come forward with information that will help keep communities safer from guns and prohibited weapons. Our message to the public is this: if you know anyone who may own or have access to an illegal firearm then please call Crimestoppers. Your call could help save lives. “Despite our good work we know that firearms can enter the criminal market through a variety of means, including thefts from legitimate holders or dealers. Law enforcement, together with security and intelligence services, are working tirelessly to locate these weapons, confront the terrorist threat and keep the public safe.” He added that it was imperative that these firearms are intercepted before they can do immeasurable harm to communities. “Ultimately it is communities that defeat terrorism and our collective safety depends on everyone’s efforts to report criminality and a possible firearms incident,” he said. The NCA’s Director General, Lynne Owens, added: “Suppressing the availability of illegal firearms in the UK has never been a more significant priority for the law enforcement community. Criminal networks, who think nothing about who they sell firearms to, present a significant route by which extremist groups will try to access the sort of weapons used in recent attacks in Europe. She explained the NCA has active operations against the groups involved in supplying, distributing and providing access to firearms. Dorset Police is supporting the campaign and Temporary Detective Chief Inspector Emma Sweetzer said: “Dorset Police is committed to supporting the NCA and NCTP in this appeal for people to come forward with information that will help keep communities safer from guns and prohibited weapons. “Dorset is a very safe place to live and we do not have any specific concerns at this time, however we will continue to be intelligence-led in relation to this. I am pleased to be able to support this national campaign. “As Deputy Director of Intelligence, I would like to reiterate the importance of coming forward with any information to ensure our intelligence is robust. Don’t let guns or prohibited weapons fall into the wrong hands.